This Sidecar Bubbler is a tiny little white beauty of Grace Glass, intended for both oil and herb users! Designed in a unique fashion, it comes equipped with an inside dome percolator for bubbling up your smoke. The sidecar handle ends up in a dome-like mouthpiece offering you a pleasant smoke. 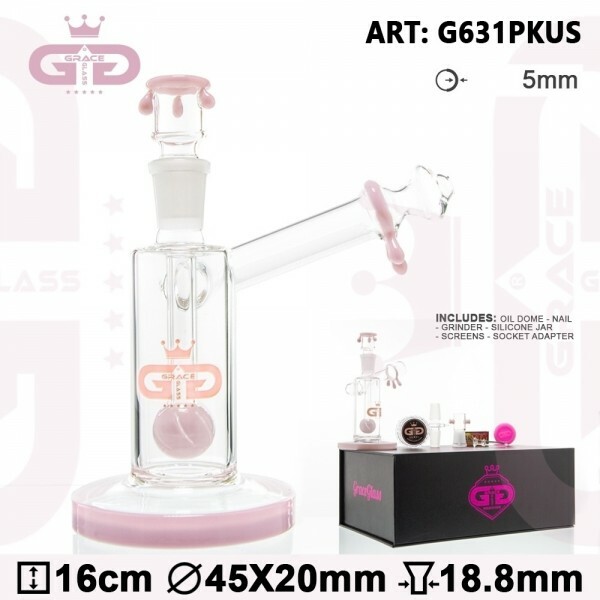 The bong is made of a sturdy borosilicate glass guaranteeing for the long duration of your smoking. Finally, the Grace Glass logo features at the front of the flatbottomed tube. The whole set-up comes in a box, including an oil dome, a nail, a socket adapter, tips, a grinder, screens, and a silicone jar.